Valley-A ladies and Singh Sabha Sports Club men won victories on Sunday April 28 to win the respective Holland Cup Finals. Valley-A won their match against reigning Champions HKFC-A to lift the Holland Cup for the first time at King’s Park. A large enthusiastic crowd of supporters were privileged to watch a match of high quality hockey played hard and with determination, but with excellent sportsmanship. Valley showed why they are 2012-13 Premier League champions. 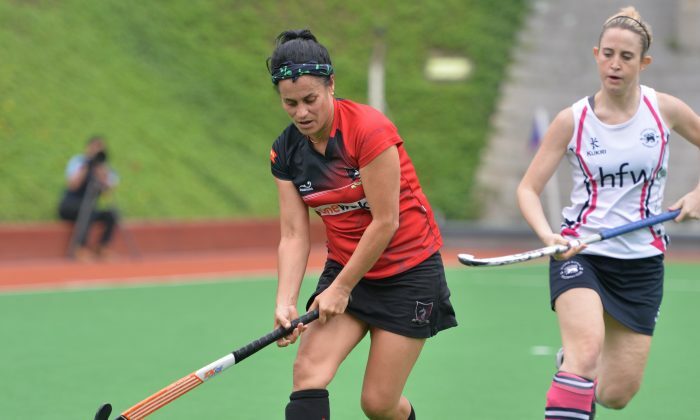 With a dedicated display of fast, accurate hockey with well distributed passes, probing for the openings and then deadly in attack they scored three top class goals to secure the victory. Valley were 0-2 up at half time, but Club pulled one back seven minutes into the second half. Valley extended their lead to 1-3 with 16 minutes left to play. HKFC-A never got on equal terms and try as they might, they could not beat the Valley defence. Every time HKFC-A got close to Valley’s goal area there was either a mass of Valley shirts in front of them, or a courageous goalie to fend off the attack. Club had quite a few chances but failed in the conversion attempts, even penalty corner shots were blocked in an expert manner. It was not Club’s Day, but Valley-A deserved the victory. Valley coach Tina Bell-Kake expressed her feelings to The Epoch Times after the match. “I think winning the Cup was the icing on the cake. I said to the girls: ‘You know champion teams back up their performances and we really needed to work today to prove that we deserved the championship this year’, so we did that and the girls have been committed and they are a great bunch of girls to work with. Asking about the team going forward she thinks that they have a good core group, but retaining them is the key to future successes. “Yes it’s just being able to keep them. Hopefully Valley being a transient club we get players year by year some come for a few years and some go. but I hope now we have a good base now to progress. Commenting on the coaching Bell-Kake explained how they had to build most of the team from the ground up. “The coaching has taken four years to get here, so although the majority of the girls have been here for those three or four years and we have just gone back to basics and learning structures and learning how to score goals. The last couple of years we targeted our defence and were not now able to put the ball away. But, I think this year, we have managed to put both together. “It’s great to see the moves working and coming together in the end. It gives the girls confidence that we can go forward from here. “Everyone has worked hard. We have a squad of 20 and every one of those players deserve the credit,” concluded Bell-Kake. In the men’s Final, which followed the women’s at Kings Park, it was a close match between Singh Sabha Sports Club (SSC-A) and newcomers to the Premier Division League, Punjab-A. SSSC-A had progressed to the Final by beating Khalsa, 2012-13 Premier Division League champions and holders of last year’s Holland Cup by a single goal in last week’s Semi-final. Punjab-A had won against HKFC-A 4-1. SSSC-A had certainly done their homework with hard decisive tackling and the ability to cut off many of Punjab’s long penetrating balls which were so effective against HKFC-A in the Semi-final. In the early stages of the game SSSC-A also played many accurate long searching balls and in many cases finding their up-field attacker. But it was a hard fought game and, as the time passed, the accuracy of the long balls decreased giving rise to end-to-end play to little effect. SSSC-A scored first after 20 minutes of play, but Punjab-A soon retaliated and equalled the score just before half time and it was still 1-1 at full time. It was not until the second half of extra time—with only eight players on the field for each team and after one Punjab-A player had been yellow carded—that a hard-hit shot towards the Punjab-A goal was deflected in the goal area, bringing an end to the match. Ahmed Ewis of Khalsa received the trophy for the highest goal scorer in the Premier Division, having scored 48 goals through the 2012-13 season and just edged out Ishtiaq Ahmed by one goal of the Pakistan Association (Pak-A) into second place. Awards were also made to the Khalsa U16 team as winners of the U16 Youth League Cup and to the Pak-A U16 team as runners up in the competition.